Yet another example of the influence WBAI has had on all radio stations is Arlo Guthrie‘s classic recording “Alice’s Restaurant.” While many in community radio now take the song and its association with Thanksgiving for granted, the song was first performed on WBAI, where reaction led to Arlo recording the song for his debut album. 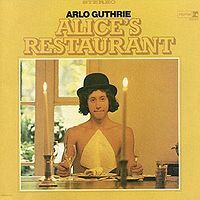 The Thanksgiving radio tradition of playing the long version of “Alice’s Restaurant” from Arlo Guthrie’s debut album probably dates back to the year after its release, 1968. Today, countless stations play the the 19 minute long monologue, probably since it’s about Thanksgiving and also well-suited to being trapped in holiday traffic. Alice’s Restaurant is also a historic piece of 60s anti-war memorabilia. Where are today’s artists with similar stories? As we approach 2010, the great decade is now 50 years old. We need to do it again! Nevertheless, I am posting here with the intention of having radio people list their station and when they will play the album. I have received notices from WFUV and KFOG, in New York and San Francisco, respectively. Mark Radway from KRVO, Kalispell Montana will be playing it too. There must be hundreds of other stations, so please let me (and maybe some potential listeners) know if Alice’s Restaurant will be open in your town this Thanksgiving. If not, stream it! Video of Arlo Guthrie performing the song follows after the jump.